The expected shake-up in the order just did not happen in the practice sessions in Barcelona. The teams to beat are still Brawn, Red Bull and Toyota, Williams is still putting on a great show with quick times and the giants of last year have not yet solved their problems, double diffuser or not. BMW had the most heavily revised car, albeit without double diffuser, and they went quickly in the first session, grabbing third and fourth fastest times. This looked less impressive in session two when Kubica and Heidfeld were only 16th and 17th, but BMW fans must hope that they were trying race settings and heavier fuel loads. Certainly, their times were a second quicker in the morning, which would confirm this. Jenson was quickest for Brawn GP in session 1, dropping to sixth in the afternoon, and Barrichello managed tenth (P1) and fourth (P2). They both spent little time on the softer option tires, however, and were probably working on the race rather than showing off. I have no doubt that they will be in the hunt for pole in qualifying. Toyota put in some quick times in the first session, Trulli ending up second with Glock eighth, but took the BMW strategy of race settings in the afternoon. Eighteenth and nineteenth spots are definitely not representative of their true potential. Two teams that seem to have been reading my blog were Renault and Williams. They changed their strategy somewhat by allowing the second driver to have the same settings as the lead and the times reflected this. Nakajima was right with Rosberg in the first session (5th and 6th) and then headed the time sheets for a long time in the afternoon, finally being bumped down a peg by one of Rosberg's late runs. The resultant 1-2 for Williams really needs to be converted into a similar showing in qualifying if we are not to start discounting these practice showings from Williams. Piquet was quick in both sessions in spite of visiting the gravel traps quite frequently and he proves that the Renault's improvements have made a difference. They are well ahead of Ferrari and McLaren and very close to being able to worry the front runners, especially when Alonso has a go with a light fuel load. Webber and Vettel in the Red Bulls looked fast and set the pace on occasion. In the end they were a little down on where we have come to expect (5th and 7th in P2), confirming that the RB5 is less competitive on circuits that require high downforce. Watch out for them in Monaco, however. The sister team, Toro Rosso, improved somewhat from their previous races, Buemi again leading the way with 9th in the afternoon, Bourdais in 11th. Fisichella in the Force India made steady progress through the sessions and ended up twelfth, just ahead of the McLarens. It was a shame that Sutil could not run in the second session due to a fuel tank problem but the team must be heartened by their continuing improvement. As for the big boys, Ferrari and McLaren, it appears that their updates have made little difference to their places in the pecking order. This may change tomorrow when everyone's hand is revealed but they will not be disputing pole, that is for sure. has anyone made progress? Have they all made the same steps forward? All 22 cars BECAUSE Mclaren'S and BMW's and Ferrari's changes don't seem to have placed them further up the grid. The only team wrangling it out up front visibly so is Renault with Alonso and even Piquet (finally). So what are we to make of this - sandbagging? Or did really no one make any progress. That would be a disaster knowing teams most have spent a few bucks on new parts. I think more than ever, this friday might not give a complete picture as nearly every team was using the opportunity to actually do test in their packages. But it does look like little chang. BMW is back where they were in the first two races (not a huge surprise as the car was good and the awful recent form was due to wait to bring all the new stuff just here) and Renault keep improving. If Ferrari was going anywhere near there actual performance there must be panic at there motorhome right now. "BMW had the most heavily revised car, albeit without double diffuser, and they went quickly in the first session, grabbing third and fourth fastest times." Did they not do something similar in Bahrain? I seem to remember them being 2&3rd behind Hamilton in P1 then. "Eighteenth and nineteenth spots are definitely not representative of their true potential." They may have got better, but their last lap was spoiled by Rosbergs incident. Talking of which, the BBC commentators thought that was due to running out of fuel, and if this was the case, they really were showboating. Willliams have so far not given a reason that I can tell. Piquet was lucky to survive all those trips into the gravel, he'd best hope he doesn't repeat of that tomorrow or sunday, as he may not be so lucky next time. Like BMW, given the difference between practice and the race in Bahrain, I'm viewing Force Indias showing with a little scepticism, much though I hope that's unwarranted. "As for the big boys, Ferrari and McLaren, it appears that their updates have made little difference to their places in the pecking order." 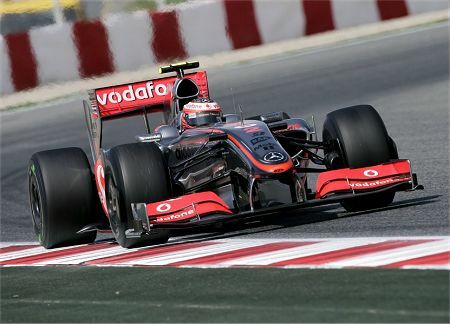 I was under the impression McLaren had made few changes this week, and given Barcelona doesn't really suit the car. Q3 looks like it may be hard to reach for them, considering their placing in P1 in China and Bahrain. Ferrari seemed a bit fraught with reliability issues during practice. I'd expect them to be faster than what they've shown so far in qualifying. Michael: Yes, it looks as though all the teams have improved by similar amounts, leaving the pecking order pretty much unchanged. Renault seem to have taken the largest steps forward, however, although it's difficult to tell since they have been leading the chasing pack for some time. McLaren, if anything, look to have fallen behind a bit more but I think they'll be better tomorrow. I don't think any of the teams are actively sandbagging - none of them have a big enough advantage to do that. Some will have been concentrating more on race set up than setting quick times however. And BMW had better be one of those! Filipe: Ferrari do tend to be better once qualifying starts so the tifosi must hope for the normal pattern to resume tomorrow. Otherwise, Ferrari are in big trouble! I hope you're right about BMW - they really need to be back near the front quickly if they're to stand any chance in the championship at all. Mr Soap: "Did they not do something similar in Bahrain?" Please, don't remind me - I'm trying to forget Bahrain! Seriously though, I am hoping that the updates will make all the difference and the Beemers will not be humiliated again. At least the car looks prettier now. I haven't seen any reason given for Rosberg stopping either but I doubt it was caused by low fuel. Nico was having a good look at the rear of the car afterwards and this makes me think the problem was mechanical. But it's true that Williams set their fast times in practice on very low fuel load - qualifying always proves that. Toyota did a lot of laps during the session and were definitely looking at race set up. No doubt you're right and the idea was to go for a quick time in the end, which Rosberg spoiled, of course. They'll be fast tomorrow, however. I agree regarding both McLaren and Force India, except that expect Hamilton to fare better in qualifying. He is like Alonso in that he can make up some of the difference. I'm so overcome with rage over the 2010 regs that I can't seem to focus on anything else. However, I have to comment on how nice your new header looks. It's a great shot. Thank you, Marc. As regards the 2010 regs, there is one bright spot - the "winner takes all" system has been changed back to the existing championship points system. I have written a post on this and just published it. Thanks Clive here a comment from Brad Spurgeon's New York Time F1 Blog. This is Adrian Newey about why he opted against using one car with and the other without KER-System.
" He said that one of the reasons he had elected not to put Sebastian Vettel or Mark Webber on KERS - the way BMW Sauber is doing with Nick Heidfeld over Robert Kubica - is that doing so meant losing the technical benefit of being able to weigh data from two of the same cars against each other to find the best solutions to problems. In other words, a KERS equipped car is not the same as a non-KERS equipped car and so when analyzing the way the two cars react, you lose all the benefit of having two cars to solve a problem. The reactions of the two cars cannot be compared." Hm... If F1 is all about having the right approach then this Mario Theissen is beginning to rather look silly - more and more these days. I am sorry but there is something really odd about the your "Fav" team Clive. It's the same with Jenson Button and Brawn GP. Yes they are successful and yet I just can not warm up to either teams and in regards to Jenson boy was I joyous back in the day in Hungary but an outdated love is just that outdated. He deserves a damn good ride but WHY now ;-) I want to see Alonso and Hamilton and Kimi and Massa sling it out at the top. Well, I have to admit that I've had my doubts about some of the things Dr Theissen has done and said this season, Michael. But he has been right in previous years so I think he'll pull the team together in time. And dropping KERS for the moment was certainly a step in the right direction. I think Piquet was running light just to give him a break by not being painfully slow. I don't think when things get serious that he will be any better than normal. I am very curious about a comment from Raikkonen's engineer on the radio. Kimi was complaining about the car and the engineer said that the set up he was running was the intended race set up. I can't ever recall anyone divulging that kind of info before. It was almost like they were sandbagging and he was trying to convince the opposition that they had no pace. I just don't believe they have any more pace to give. Yes, I heard that exchange too, Steven - in fact, one of the Speed TV commentators also mentioned never having heard that sort of info on the radio before. You could be right as to the reason, although I've never understood what benefit it is to Ferrari for other teams to think they're faster than appears. Pride? As for Piquet, we can be certain that Alonso was running on fumes for the quick laps, so Piquet running light too gives us a chance to see that he's not so bad after all.